Americans are very familiar with the continual failure of dollar coins in every day use. In recent years, the Susan B. Anthony and the Sacagawea Golden Dollar have lost their acceptance battle. 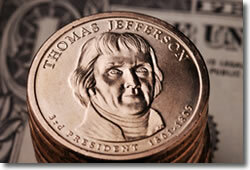 Today, the new Presidential $1 coins honoring U.S. presidents is failing. Over one billion of the coins have been minted since the series start in 2007. Yet, few are ever seen in daily use. The paper bill is the currency of choice. The U.S. Mint hopes a new marketing campaign will change people’s minds. They have selected four cities — Austin, TX; Grand Rapids, Michigan; Portland, Oregon; and Charlotte, North Carolina — as their testing bed. The latest campaign takes a "green" approach, marketing how paper dollars waste money and harm the environment. To help America, the four city residents will be told to use "100 percent recyclable" coins that last decades instead of 21 months, like a $1 note’s typical lifespan. "This is the first program of its kind to inspire shoppers, diners and commuters to use $1 Coins in their normal, everyday activities," said United States Mint Director Ed Moy. "When each of us spends the $1 Coin, we make a difference for our country, because the $1 Coin is durable and using it saves the Nation money. We hope our pilot cities lead the change!" The U.S. Mint is required by law to promote the new Presidential coins, and their latest approach is perhaps one of the most unique ways to date. It rides the growing green train. But then there are today’s facts that starkly contrast against any campaign for dollar coins. Dollar bills bear little to no physical and mental burdens for anyone. Their reason for use outweigh the tangibles of every day transactions using $1 coins. Marketing the coins as a green solution will not begin a viral surge to use them. What will work? The history of previous dollar coin failures has already drawn up the successful picture. Removing dollar bills from circulation is the only event that will cause Americans to carry $1 coins in any significant quantity. With all the advantages of banknotes, why do we use coins at all? Quarter dollar bill, anyone? If the half dollar coin and the two dollar bill were more widely circulated, we wouldn’t need to carry around so many dollar bills (or coins), which would lessen the advantages of bills over coins. I’d give up $1 bills in a heartbeat. I hate them. Dollar coins all the way… if only I didn’t get an ugly look when I ask for a few rolls at my bank. All the Mint has to do is simply stop making $1 bills, like the author says.. problem solved! People would cry for a bit, and then simply get over it. If bills went away, people would just use their cards. All transactions will be digital before end-century. Most people prefer One Dollar Bill for transaction of money. And think that One Dollar Coin is for collector. Since One Dollar Coins are popular with coin collector, but not for use of purchasing goods and service! These coins are great to use. Even just to give a little excitement to a cashier or server. Since you can’t really get anything anymore for a dollar, but maybe a $1.25 or $1.50 in a vending machine, the $1 coin only makes sense for use. Bring back the $2 bill so you have a low commodity bill and the $1 coin is used in the vending machines and parking meters. Sure, maybe more people will use the $2 bill, but the government would produce less of them when compared to the $1 bill and I think as a result the $1 coins would be utilized more. I live in the US but am originally from Canada where we not only have a $1 coin but also a $2 coin. They are a lot easier to use, especially for those people who use parking meters, public laundry facilities, car washes, etc. Instead of using handfuls of quarters you only need one or two dollar coins. For example when I did laundry in Canada I used 2 dollar coins for washing. Here I use 6 quarters for washing. The solution is to stop making dollar bills and start making two dollar coins. With $1 and $2 coins, you only have to carry two coins at most. Carrying two coins is easier than carrying 4 bills. Why don’t we do away with pennies? They are worth far less than the old inflation-adjusted half cent was. Is it true that the “In God We Trust” has been removed? If so, I as a christian, will have no part of this new coin, whether is is “green”, convenient or anything else. Once again the US Mints fails! actually making a coin people can see within 1/2sec that it’s a dollar coin. 1: Make it thin a light. 2: Put a big 1 on it instead of a face of some dead person. Eventually inflation will make the $1 coins seem more reasonable, when a $1 coin buys what a quarter used to buy. Merchants don’t accept credit cards for tiny purchases. I wish that our coins did not have God on them. “In God We Trust” makes Americans sound not very bright, intellectually. I’ll also mention that German soldiers in WWII had “Gott Mit Uns”, or “God With Us”, on their belt buckles, and they still lost the war. Therefore, the word “God” does not seem to offer much protection.